The jury is still out on whether curved TVs are the devil's work or home entertainment bliss, and PC monitors are next in line for a thorough inspection. There is an argument that curved PC monitors make more sense as you're sat closer to the screen, and judging by Samsung's newly-outed SD590C, the South Korea-based company clearly agrees. 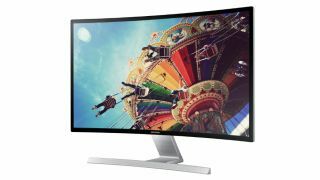 Samsung reckons that its 27-inch, full-HD (1920 x 1080) monitor is easier on the eyes than traditional panels because its curved shape lets you see the edges of the screen more easily than if it was flat. As such, it is being aimed at 9-5 office workers, in addition to gamers thanks to a number of gaming-friendly features. They include a one-click Game Mode, which dynamically alters colour, contrast and sound to make action more lifelike, in Samsung's eternal words. Gamers are more likely to be interested in its relatively low 4ms response time and standard 60Hz refresh rate. Other specs include a 3000:1 contrast ratio, 350cd/m2 brightness and a VA panel type. Ports include D-sub, HDMI and DisplayPort. The SD590C retails at $429.99 (around £265.22, or AUS$492). In comparison, you can pick up a flat 27-inch 1080p monitor for as little as £150 (around $243, or AUS$278), so Samsung is clearly hoping that its features tick the boxes for users looking to go curved. Who else has introduced a curved business monitor?